[RECAP] Jesus called this Gentile woman with a little daughter who has great needs…He called her a dog. How can He be so harsh? How can He be so ugly? How can He do that? What if He didn't call her a dog? What if He used a word with a particular connotation? The connotation of a puppy? That changes things. Now, I know, I know the theology of this passage that He's telling her that He has to focus on the Jews, it's not yet the Gentiles turn. I understand that, but you don't have to call somebody a dog to make that point. I think there's more here. I think Jesus is giving the woman an opportunity to trust Him. You don't take the children's food and just throw it to the puppies. Huh, I suppose some of you, surely, had a dog, a puppy when you were growing up. So I ask you, where is that puppy at dinner time? And I know the answer. That puppy was right under the table. And what was that puppy doing? That puppy was begging. And what did your father say? 'Don't feed that dog! I didn't work all week long to feed that dog!' And what did you do? You fed the dog, didn't you? You fed the puppy. And I believe Jesus gives this woman an invitation. You know what? This is very unique. He didn't go, He didn't touch, He didn't say…He didn't say, 'demon be gone!' He just simply announced to her that the demon was gone. Amazing! You may recall that this only occurs one other time and that's when there was a Centurion who had a servant who came to Jesus and said, 'You don't have to come, You don't have to come. I give an order and it's taken care of. I don't have to go. I just know if I give the order, it's done. You have authority, You give the order and it will be done.' And Jesus said, 'It is done.' And Jesus said, 'Never have I seen faith like this, not in all of Israel.' (cf. Mt. 8:10; Lk. 7:9) And this Syrophoenician woman has an immense trust in Jesus. She acts on what she understood. Now, consider that in relation to the disciples. They had vast knowledge. As they were growing up, they were taught about Messiah. They knew the Bible. They were looking for Messiah. In the era in which Jesus came, the nation itself was actively seeking for Messiah. There were others who made such claims. They were searching for Him. And yet the disciples with all their knowledge did not understand the incident of the loaves. Why? Because their heart was hardened. That's the message to them. You're not getting the point. 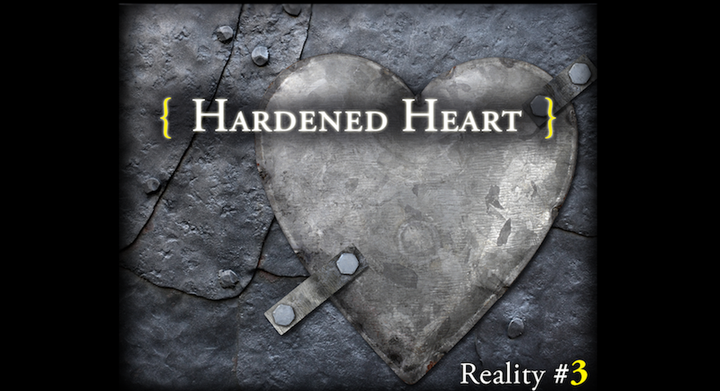 Because your heart is hardened. A message we need to think about. Now, Jesus moved from Tyre all the way back down across the northern part of the sea of Galilee and then down further to Decapolis on sort of the south central side, below the edge of the sea of Galilee. And here this was semi-GentIle territory. It was both Gentile and Jewish. It was where the tribes, the ancient tribes who did not come into the promise land stayed. So it had always been partially Gentile and partially Jewish. And He came and "…some people brought to Him a man who was deaf and could hardly talk, and begged Him to place His hand on the man." (Mk. 7:32) And He took him aside away from the crowd, put His fingers into his ears as a symbolic sign that He was going to pull the plugs out of his ears. He spit on his tongue…ancient belief that spit has medicinal quality. And what He's saying to the man is, 'I am going to heal you! You are going to hear and you are going to speak clearly.' Notice that He moved him out of the village and away from the people into a place He was privately talking with this man. And He did it. And there's a message to the disciples. That message is this. You hear what I'm saying, but your ears are deaf. Your tongue is crippled. So, you have knowledge, but don't understand. You hear, but don't perceive. You don't grasp. So when you speak, you're not saying what needs to be said clearly.